Heat oven to 350°F. Generously grease 12 regular-size muffin cups with the butter. In medium bowl, beat eggs and milk until well blended. Stir in salt and pepper. Arrange bread, cheeses, meats and vegetables in separate bowls. 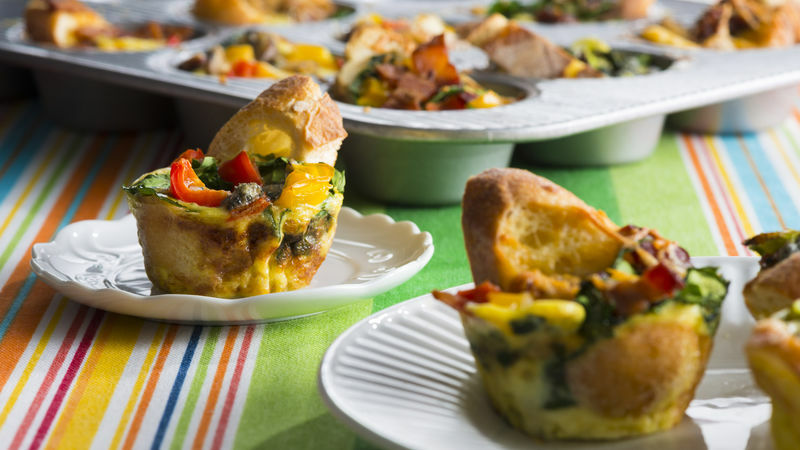 Allow each person to build their own egg bake in muffin cup(s). Start by pressing 1 or 2 bread pieces/slices in each muffin cup then add a total of about 1/4 cup of desired fillings to each cup. When all muffin cups are filled, pour egg mixture over each to cover. Bake 12 to 15 minutes or until set and knife inserted into egg mixture comes out clean.